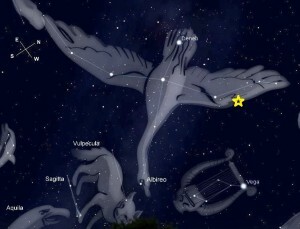 It was reported in the news recently (January 2017) that astronomers are fairly certain that a new and very bright “star” will appear in the constellation Cygnus (the Swan) sometime around the year 2022. (i) It is believed by some that the appearance of this new star could have repercussions of Biblical proportions! Cygnus contains the well-known Northern Cross which is so-named due to its brightest stars creating a distinct Christian cross shape in the Northern hemisphere. This new star will be caused by two existing binary stars colliding and exploding into a new star that will be 10,000 times brighter than they currently are. Actually, this explosion already happened 1795 years ago, but since the star is 1,800 light years from earth, it takes 1,800 years for its light to reach us. Once the new star appears, it’s expected to be one of the brightest objects in the night sky. It’s an incredibly rare occurrence for the creation of a new star to be visible to the naked eye. The intense brightness of the new star is expected to last for about six months before it begins to dim and eventually return to its original brightness. The new star is predicted to appear near the edge of the right wing of the constellation Cygnus. Whenever a new “star” has appeared throughout history, it has inevitably been thought to be a portent of some monumental event on earth. Certainly, the most well-known example of this is the “star” of Bethlehem that the three wise men or Magi followed to find the baby Jesus as told in the Biblical Book of Matthew. Recently, Israeli Rabbi Yosef Berger, of King David’s Tomb in Mount Zion, Jerusalem, was in the news because he believes that the appearance of this new star in 2022 is evidence of an ancient prophecy which predicts the arrival of the Messiah. (ii) This prophecy occurs in the Zohar, the chief text of the Jewish Kabbalah. Upon reading that the new star would appear in the constellation Cygnus, I immediately thought of Nolan’s Cross on Oak Island, Nova Scotia. Oak Island is the site of the world’s longest running treasure hunt which began in 1795. You could say that the Oak Island mystery is in my blood as five different generations of my extended family have been active searchers on the island, on and off over a stretch of almost 100 years. More recently, Oak Island researcher and author Petter Amundsen has shown that not only does Nolan’s Cross mirror the Northern Cross portion of the constellation Cygnus but that it also perfectly creates half of the Kabbalistic Tree of Life. 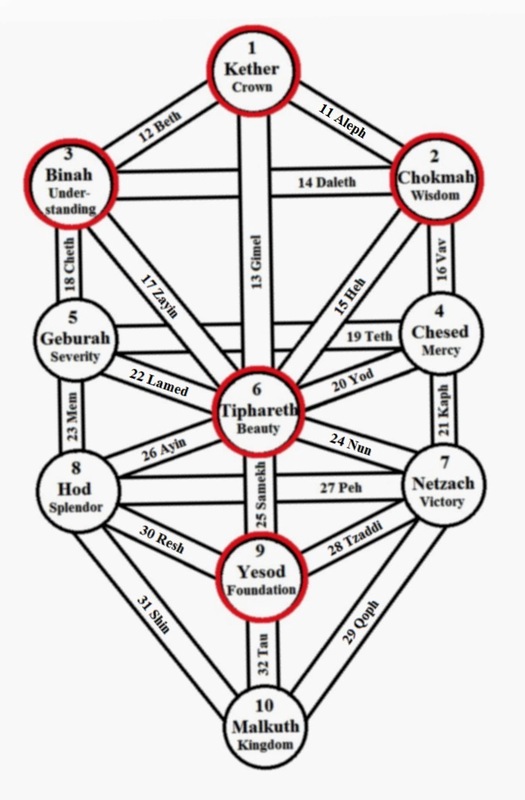 This Tree of Life is the central mystical symbol used in the Kabbalah of esoteric Judaism and is also known as the 10 Sephirot or Sephiroth. From the Renaissance period onwards Jewish Kabbalistic texts were studied and translated by Christian scholars of Hebrew as well as Hermeticists. The Christian version is referred to as Cabala, and the more recent Hermetic version is known as Qabalah. Hermetic Qabalah focuses on the practical aspects of Qabalah including magical manipulation. 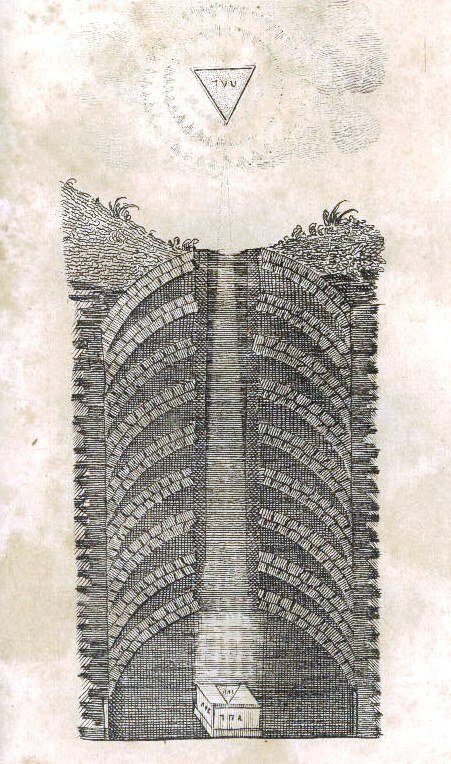 Petter Amundsen believes that the group responsible for the original workings on Oak Island, including the placement of the boulders in the Kabbalistic Tree of Life pattern is the Fraternity of the Rosy Cross (later known as Rosicrucians) of which he believes a key member was Francis Bacon. There is much evidence to support the idea that Bacon was very likely a driving force behind both the Rosicrucian and Masonic movements. One thing that is central to both Rosicrucian and Masonic teachings is the existence of a physical sacred vault underground which contains priceless artifacts. This idea of a deep vault containing treasures is of course very reminiscent of the Money Pit on Oak Island and what searchers hope to find. The original Fraternity of the Rosy Cross was said to be a secret brotherhood of alchemists and sages who became known to the world after the publication of their manifestos which are filled with references to Kabbalah, Hermeticism, alchemy and Christian imagery. The first of the manifestos is called Fama Fraternitatis (1614) and the second is Confessio Fraternitatis (1615). It is arguable whether or not this original Brotherhood existed, but the ideas and reforms put forth in their manifestos caused a huge reaction among intellectuals and esoteric circles in Europe with many attempting to join the fraternity. 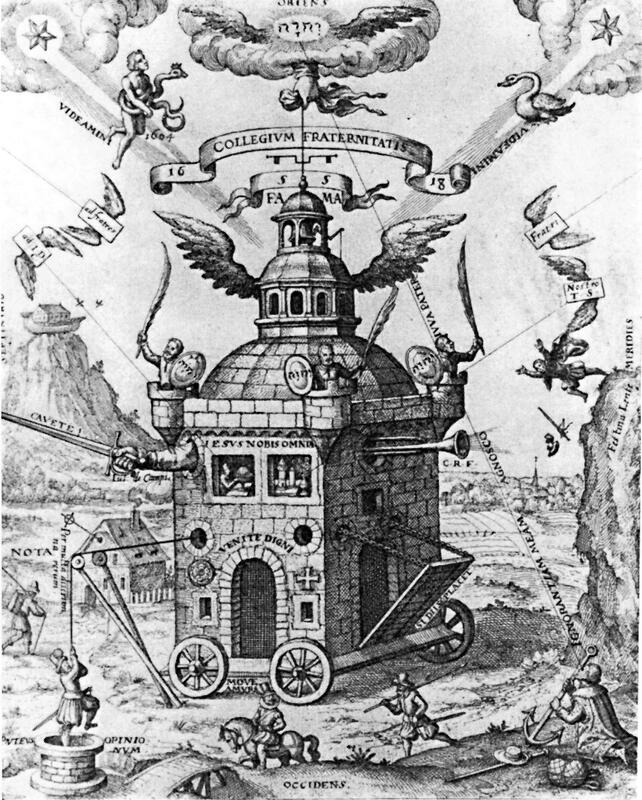 The organization of Freemasonry absorbed and was deeply influenced by Rosicrucian ideas. Rosicrucians placed considerable importance on the appearance of two new stars which appeared shortly before their manifestos were written. The first star appeared dramatically in the year 1600 in the constellation Cygnus and the second appeared in the constellation Serpentario (now called Ophiuchus) in the year 1604. This second star was actually a supernova. The Invisible College of the Rose Cross Fraternity, 1618, by Theophilius Schweighardt. Note the two stars in the upper left and right corners. The star on the left has its light shining through the Serpent Bearer (Serpentario) and the star on the right is shining through the Swan (Cygnus). Solomon refers to King Solomon, whom the Bible calls the wisest man of all. The Bible describes how God came to Solomon in a dream and told him that he could have anything he wanted. Instead of asking for wealth or power, the king asked for wisdom to better rule his people. God was so impressed with his request that he granted him unsurpassed wisdom. King Solomon was also known for building the First Temple (Solomon’s Temple) in the tenth century B.C.E. in ancient Jerusalem to house the Ark of the Covenant. 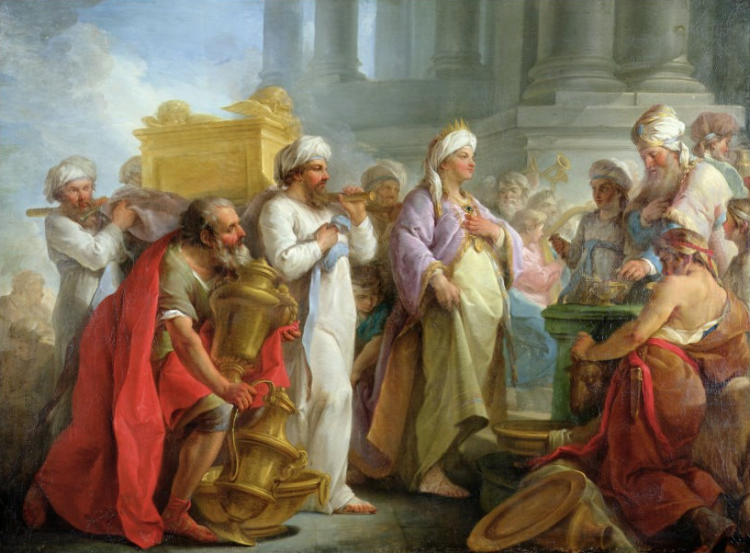 Solomon Before the Ark of the Covenant by Blaise Nicholas Le Sueur, 1747. The Apocalypse of Adam is one of the Gnostic Gospels that were discovered in 1945 at Nag Hammadi in Egypt. This text dates to the first or second century and refers in part to a legend in which King Solomon sends out an army of demons to seek a virgin who had fled from him. The tradition of Solomon having control over demons culminates in the early pseudographical text known as the Testament of Solomon. This work describes how Solomon was able to build his temple by commanding demons by means of a magical ring that was entrusted to him by Archangel Michael. 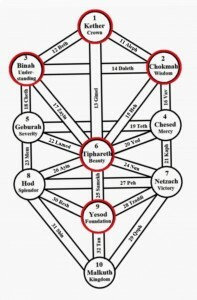 These and other similar accounts of King Solomon’s use of magical manipulation had a strong influence on the later Hermetic Qabalah of the Renaissance. Francis Bacon was certainly a man of the Renaissance, and among his numerous writings, he wrote about his vision of a utopian society which he called “Solomon’s House” in his unfinished novel New Atlantis. It was published in 1627 after Bacon had passed away. In the story, “Solomon’s House” is created on the mythical island of Bensalem. The name Ben-Salem can be interpreted as “Son of Peace” or “Son of Jerusalem” (New Jerusalem). An earlier organization linked to both the later Freemasons and Solomon’s Temple was the Poor Fellow-Soldiers of Christ and of the Temple of Solomon, otherwise known as the Knights Templar. They were a Catholic military order founded in 1119 to protect pilgrims in the Holy Land. In 1120 King Baldwin II of Jerusalem granted Templars a headquarters in a wing of the royal palace on the Temple Mount in the captured Al-Aqsa Mosque. This mosque was believed to have been built over the ruins of the Temple of Solomon. 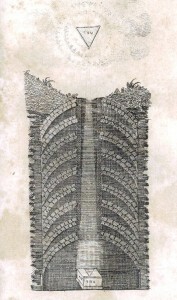 Some researchers claim that Templars spent the first years of their existence digging under the Al-Aqsa Mosque and into the old Temple of Solomon. There they allegedly discovered Biblical treasures including the Ark of the Covenant. The fraternity of Freemasonry has long claimed a direct link with the Knights Templar. Certainly, the highest degree in the York Rite of Freemasonry is called the Order of Knights Templar, but we know that the medieval Knights Templar were disbanded in 1312 and the earliest records of Freemasonry don’t appear until the year 1598. That’s a gap of 284 years or about 13 generations. But what if the original Templar knights didn’t just suddenly disappear? In Portugal, the Templars of Tomar simply changed their name in 1318 to the Order of Christ and continued for another 592 years until the year 1910 when the Portuguese monarchy ended. The Order was revived again in 1917. Most of the 14th-century Templar knights and their properties merged with the Order of the Knights of the Hospital of Saint John of Jerusalem or the Knights Hospitaller. In Scotland, some sources claim that the combined Templar / Hospitaller order continued as the Order of St. John and the Temple until the Scottish Reformation. The original Templars, although no longer going by the same name, could certainly have maintained whatever secrets or customs they may have held previously and passed them on to future generations. The oldest Masonic records in the world are from Aitchison’s Haven Lodge on the outskirts of Edinburgh, Scotland, and the second oldest minutes (dating to 1599) are from the Lodge of Edinburgh (Mary’s Chapel) No. 1. Both of these lodges were less than 10 miles from the original Knights Templar preceptory (or headquarters) in Scotland at Balantrodoch (now called Temple). In 2009, accomplished writer and historical researcher A. J. Morton wrote a thesis that provides new research into the Knights Templar and Hospitallers and their connection to the medieval craft guild of Masons at Kilwinning on the west coast of Scotland. This paper was well received among the academic community and was even brought to the attention of the Scottish Parliament, yet very few people outside Scotland know about it. In 2011 Mr. Morton wrote me through e-mail that he was quite sure that his thesis proved once and for all a historical connection between the original Templars and the modern Freemasons at Kilwinning. He went on to explain that Kilwinning Lodge (known as “Mother Kilwinning” among Freemasons) is surrounded by Templar properties. Even if one believes that there is no definite historical connection between the medieval Templars and the Freemasons, it’s safe to say that both Rosicrucianism and Freemasonry incorporated certain Templar ideologies including Gnosticism and esoteric teachings that they likely learned in the Holy Land. The Temple of Solomon is crucial to Freemasonry and is featured in a number of its degree rituals. Masonic lodges with their central pillars Jachin and Boaz are also modeled after Biblical descriptions of Solomon’s Temple. To recap, we have news that a new star will appear in the constellation Cygnus. 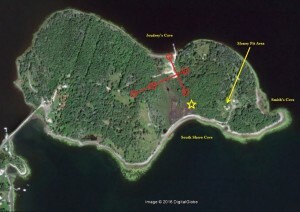 When this star is mirrored down to Nolan’s Cross on Oak Island, it gives a location that is not far from the “Wisdom” sephiroth boulder. What if this new star is actually pointing to a specific spot on the island which in light of its proximity to the “Wisdom” sephiroth marker indicates something buried below that embodies God’s wisdom in physical form? We’ve looked at three esoteric brotherhoods where King Solomon, known for his unsurpassed wisdom, is a common central figure. These are the medieval Knights Templar, the Fraternity of the Rosy Cross (Rosicrucians) and the Freemasons. 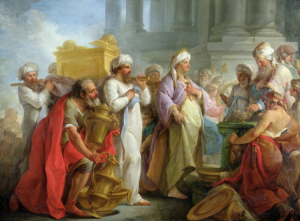 King Solomon is also known for building the Temple which housed the Ark of the Covenant. Not only did the Ark hold the Ten Commandments of God’s Law or Wisdom written in stone but the Bible tells us that God spoke to the Israelites from between the cherubim on the Ark. The Ark then is a physical conduit for God’s Wisdom. 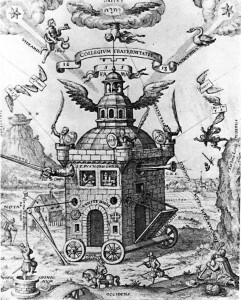 If Templars, Rosicrucians or early Freemasons did bury anything below or near the “Wisdom” sephiroth boulder on Oak Island, I believe it is very likely the Ark of the Covenant. Freemasonry has been intertwined with the Oak Island mystery since its beginning. Over the past 222 years, there has been an unusually high percentage of Freemasons involved in the ongoing searches on Oak Island. What people do not realize is that quite a few of the earliest lot owners on Oak Island were Freemasons. In fact, known Freemasons owned close to 30% of the island before the 1795 discovery of the so-called Money Pit. 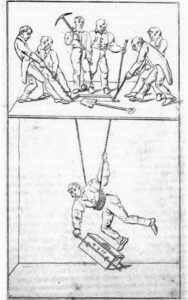 Freemasonry has three main degrees modeled after the medieval craft guilds of Stonemasons. These are the Entered Apprentice, the Fellowcraft (Journeyman) and the Master Mason. Around the mid-eighteenth century, two appendant bodies of Freemasonry began to emerge. These are the “Scottish Rite” and the “York Rite” which each offer additional degree teachings. 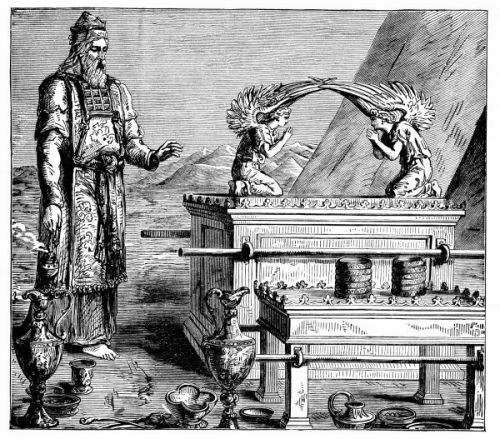 The three Craft degrees contain teachings related to the building of Solomon’s Temple, while certain Scottish Rite and York Rite degrees intimately involve the Ark of the Covenant. 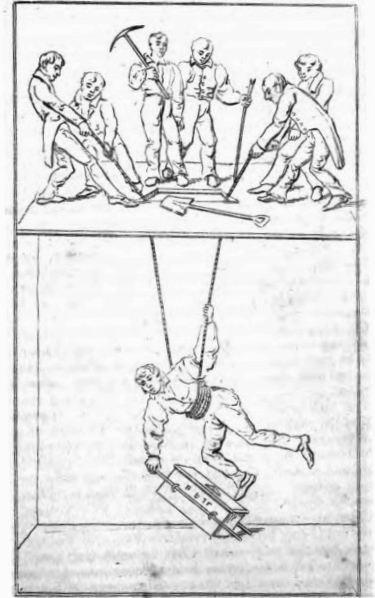 It appears that in the earliest days of Freemasonry the degree rituals were meant to be as realistic as possible. The 13th degree of the Scottish Rite has had a number of different names. It’s been called the “Royal Arch of Enoch” or “Knights of the Ninth Arch” and the “Royal Arch of Solomon.” In the opening of the ritual recorded by Henry Francken in 1783, it states that “the place where this Royal Lodge or college is held, ought to be in a very secret place, and should be underground vaulted, without either door or window, with a small trap door at Top, big enough to let a brother through.” The description of the vault is identical to that described in the “Select Master” degree in the York Rite. “Thirteenth Degree” from The Book of the Ancient and Accepted Scottish Rite of Freemasonry by Charles McClenechan, 1884. Select Masters Degree from The True Masonic Chart or Hieroglyphic Monitor by Jeremy L. Cross 1826. The degrees which deal directly with the Ark of the Covenant are primarily those of the York Rite’s Royal Arch degree and those of the Royal and Select Masters degrees (Cryptic Rite). One of my relatives from Truro, Nova Scotia, was Luther Bracette Archibald. He was a Freemason for almost 50 years and a cousin of my great great grandfather, Archibald M. Huestis. They were also both cousins of long-time Oak Island treasure hunter Adams Archibald Tupper. Adams A. Tupper belonged to three different treasure hunting syndicates on Oak Island over a 55-year span. He belonged to the Truro Company beginning around 1845, the Oak Island Association and the Oak Island Treasure Company which ceased operations around 1900. One of the interesting things about Luther B. Archibald is that he became the highest level Royal Arch Mason in Nova Scotia in 1887. At that time he became the “Most Excellent Grand High Priest” in the Grand Chapter of Royal Arch Masons. He had earlier been the High Priest in his local Royal Arch chapter. The High Priest is essentially the head of the Masonic chapter, and according to the Bible, the original High Priest was the only person permitted to see the Ark of the Covenant once a year on the Day of Atonement. A Biblical High Priest, wearing the traditional breastplate with the Ark of the Covenant (Source unknown). Masonic Royal Arch High Priests wear a similar reproduction breastplate. Luther B. Archibald went on to become the Grand Master of the Grand Lodge of Nova Scotia in 1902/03, and he became the highest Masonic Knight Templar in Canada in 1909 when he became the Supreme Grand Master of the Sovereign Great Priory of Canada. Two other men who attained the highest levels of Freemasonry in Nova Scotia had much closer ties to Oak Island. Mel Chappell was a long-time Oak Island land owner & treasure trove license holder, and Reginald V. Harris was the lawyer and friend of long-time Oak Island treasure hunters Fred Blair and Gilbert Hedden, who themselves were both Freemasons. Harris also wrote the first comprehensive book about Oak Island in 1958 which many consider as the bible of Oak Island research. Like Luther B. Archibald, both of these men were at one time the “Grand High Priest” of the Grand Chapter of Royal Arch Masons of Nova Scotia. In addition, they both became Grand Masters of the Supreme Grand Council of Eastern Jurisdiction Royal and Select Masters of Canada (Cryptic Rite). Again, these are the two chapters in Freemasonry which are most closely associated with the Ark of the Covenant in their rituals, and these two men were at the very highest levels in the province. Both Chappell and Harris also became Grand Masters of the Grand Lodge of Nova Scotia. Like Luther B. Archibald, R. V. Harris also became the highest Masonic Templar in Canada as the Supreme Grand Master of the Sovereign Great Priory of Canada. Harris even organized and founded the Nova Scotia College of Societas Rosicruciana in Canada which is a Masonic Rosicrucian group. 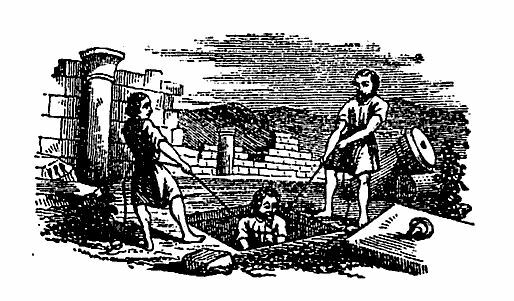 Retrieving the Ark of the Covenant in the Royal Arch degree from A Ritual of Freemasonry by Avery Allyn, 1853. One has to wonder what has drawn so many prominent Freemasons to Oak Island over the years. Has it simply been the similarities between the early descriptions of the Money Pit with the Masonic rituals involving the secret vault? Or has certain knowledge been passed “beneath the rose” between those who positioned the Tree of Life boulders on Oak Island and those who continue to protect its secrets below? What if the new star of 2022 does point to the current resting place of the Ark of the Covenant on Oak Island as well as prophesize the second coming of Jesus? The Ark of the Covenant represents God’s Wisdom in the Old Testament while Jesus Christ embodies God’s Wisdom in the New Testament. Are these signs indicative of the end times as foretold in the Biblical Book of Revelation? Or could they signal a new age of spiritual enlightenment and wisdom as striven for by Rosicrucians and Freemasons? The current seekers on Oak Island certainly don’t need to wait until the year 2022 to dig in the area that is indicated by the new star, but if the Ark of the Covenant truly is there then leaving it undisturbed might be wisest. Disclaimer: This article was written by our guest blogger Scott W. Clarke who takes sole responsibility for its contents. The views expressed by him do not necessarily reflect the views of this website.